Lynchburg Mayor Terry Burden, left, briefs commissioners on the investigation into a suspicious fire at the Lynchburg covered bridge. The new manager of Rocky Fork Lake State Park, Matthew Bourne, is shown at right. Authorities are still investigating a suspicious fire at the covered bridge in Lynchburg, and Mayor Terry Burden on Monday told Highland County Commissioners that neighbors saw three young people at the site around the time of the fire who ran away when confronted. Burden said the minister at the nearby Baptist church called the fire department, but another neighbor had the fire doused with a bucket of water before firemen from the Lynchburg Area Joint Fire and Ambulance District arrived. The village is soliciting bids for repairs on the bridge, he said, in addition to installing security cameras and enhanced lighting to prevent any future incidents. As previously reported, the Ohio State Fire Marshal’s Office is investigating the fire, which occurred on the evening of Jan. 29. Authorities urge those with information on the matter to contact the Lynchburg fire district at 937-364-2915 or the fire marshal at 1-800-589-2728. The covered bridge, which spans the east fork of the Little Miami River and connects Highland and Clinton counties was designated a national historic landmark in 1976. Also Monday, commissioners signed off on a pair of proposed business quotes, one of which will help bring a new body scanner closer to reality at the Highland County Jail. Commissioner Gary Abernathy told The Times-Gazette that the revenue savings coming from Advanced Radio Technology’s bid for a 911 backup system will allow for the purchase and installation of a body scanner at the jail. Health Commissioner Jared Warner told commissioners he had a meeting scheduled for Thursday with Sheriff Donnie Barrera dealing with site approval for installation of the security device. 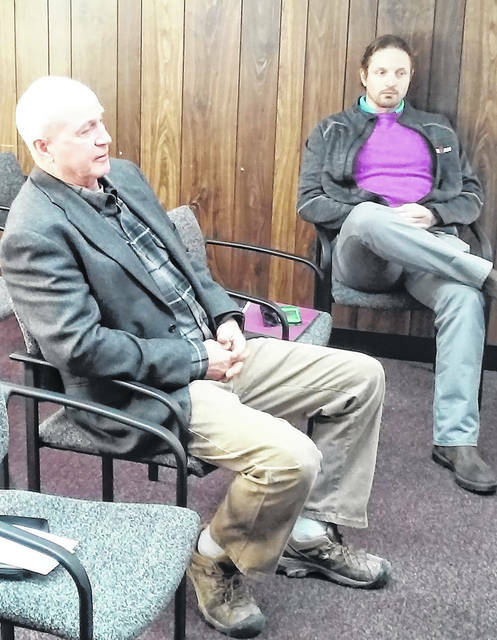 In other business, Matthew Bourne, the new manager of Rocky Fork State Park, appeared before commissioners seeking direction and information regarding high electrical usage at a rest area at the East Shore Marina, saying he suspects other improvements made at the park over the years could be the cause of the spike in electric bills. Bourne, a native of Great Britain, was previously a golf course superintendent at Shawnee State Park and prior to his arrival in Highland County, he managed both facilities at Shawnee State Park and Hueston Woods State Park. In other matters, Priest Millwright Services tendered a bid for installation of additional storage space at the Highland County Sheriff’s Office.